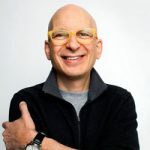 Seth Godin is the author of 18 books that have been bestsellers around the world and have been translated into more than 35 languages. He writes about the post-industrial revolution, the way ideas spread, marketing, quitting, leadership, and most of all, changing everything. His blog (which you can find by typing “seth” into Google) is one of the most popular in the world.